Do you need to buy a new handbag and want to find the best handbags shops in Kerala (State)? If you love fashion and you are never out of style, or you just need to find a day-to-day handbag, you are in the right place. 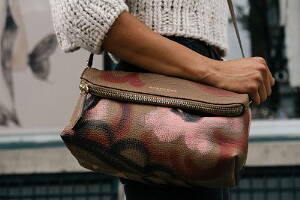 In Infoisinfo we offer you information about the best handbag shops in Kerala (State). If you want to find the best leather handbags for ladies, branded bags, travel bags or more affordable ones, have a look at the list of handbags shops in Kerala (State) that we’ve prepared for you. What handbag should I choose? There are many types of bags for different ocassions that you can found in handbags shops in Kerala (State) . We offer you a little guide that we hope you find helpful for your choice. Cross-body bag: A cross-body bag is something all women need in their wardrobe. As it is hands free, it is very comfortable to wear and also lightweight, allowing you to wear with you basic things. Hobo bag: If you need to buy a handbag but you have a small budget, you should choose a hobo since it’s very versatile and perfect for different occasios, from day to night. Remember that many handbags shops in Kerala (State) have even designer bags on sale. Bowling bag: it is a quite estructurated handbag that allows you to wear as many things as you need. It’s a perfect and very cute handbag to wear to work. Tote bag: this handbag is perfect to take to the office, even better if it’s a leather tote. Casual totes are the best for daily life and moms who need to carry a lot of things. Satchel bag: you can carry this bag by the handle on the top and it is medium sized. It is great for road trips and daily life in the city. Minaudiere bag: this evening handbag will look great along your fancy dress for a cocktail party. Clutch bag: this is also an evening hand bag but much less formal than a minaudiere bag. It will fits better with your weekend looks to go to clubs and pubs. Samtain Pvt Ltd, Shop No: G-39, Ground Floor, Pioneer Towers, Marine Drive, Kochi, Kerala. Kochi. Ernakulam. Global Village, Bank Road, Kannur, Kerala, Payyavoor. Irikkur. Kannur. Regent Plaza, Ramanattukara, Kozhikode, Kerala, Kozhikode. Kozhikode. Kozhikode. P.O Road, Near High Road, Thrissur, Kerala, Thrissur. Thrissur. Thrissur. Gandhi Nagar P. O, Kottayam, Kerala, Arpookara. Ettumanoor. Kottayam. Mundayad, Kannur, Kerala. Kannur. Kannur. X X V/ 448, 449, Near Naduvilal, Round West, Thrissur, Kerala, Thrissur. Thrissur. Thrissur. Marattukalam Bazar, P. P. Jose Road, Changanacherry, Kottayam, Kerala. Kottayam. Kottayam. Shop No. G32, Saphalyam Complex, NH 47, Opposite VJT Hall, Palayam, Thiruvananthapuram, Kerala. Thiruvananthapuram. Thiruvananthapuram. TC28/2320, Near Over Bridge, M.G Road, Thiruvananthapuram, Kerala. Thiruvananthapuram. Thiruvananthapuram. Dharmodayam Building, Marine Drive, Near Sridhar Theatre, Shanmugham Road, Kochi, Kerala. Kochi. Ernakulam. Pattam Road, Thrissur, Kerala, Thrissur. Thrissur. Thrissur. Opposite Railway Station, M. A. Road, Kannur, Kerala, Payyavoor. Irikkur. Kannur. Ramans Shopping Complex, Bank Road, Kannur, Kerala, Payyavoor. Irikkur. Kannur. Round South, Near Ragam Theatre, Thrissur, Kerala, Thrissur. Thrissur. Thrissur. Near Private Bus Stand, M. C. Road, Kuravilangad, Kottayam, Kerala, Kottayam. Thalassery. Kannur. Near Federal Bank, Bank Junction, Aluva, Kochi, Kerala. Kochi. Ernakulam. City Junction, Tirur, Malappuram, Kerala. Malappuram. Malappuram. City Centre, Main Road, Payangadi, Kannur, Kerala. Kannur. Kannur. Dass Arcade, High Road, Thrissur, Kerala, Thrissur. Thrissur. Thrissur. T.K Road, Thiruvalla, Pathanamthitta, Kerala. Pathanamthitta. Pathanamthitta. M.C Road, Thiruvalla, Pathanamthitta, Kerala. Pathanamthitta. Pathanamthitta.